We've had a week of going with the flow of life around us and fitting in school when and where we could. Thankfully, 5th grade is almost complete which means it is a lot less stressful if we do not get the check marks on all of our scheduled subjects. This week saw the completion of Amber's chimes choir. The choir had three chimes performances to end their year, starting on Saturday evening, then Sunday morning (yes, I had to drive her up to church on Mother's Day for an abbreviated performance while Fred slept in! ), and finally on Monday afternoon. Not only was Monday the last day of chimes for the school year, but for the 5th graders it was their final year in chimes. While Amber is excited to be one of the kids graduating to handbells next year, it was also bittersweet to leave the wonderful chimes leader. 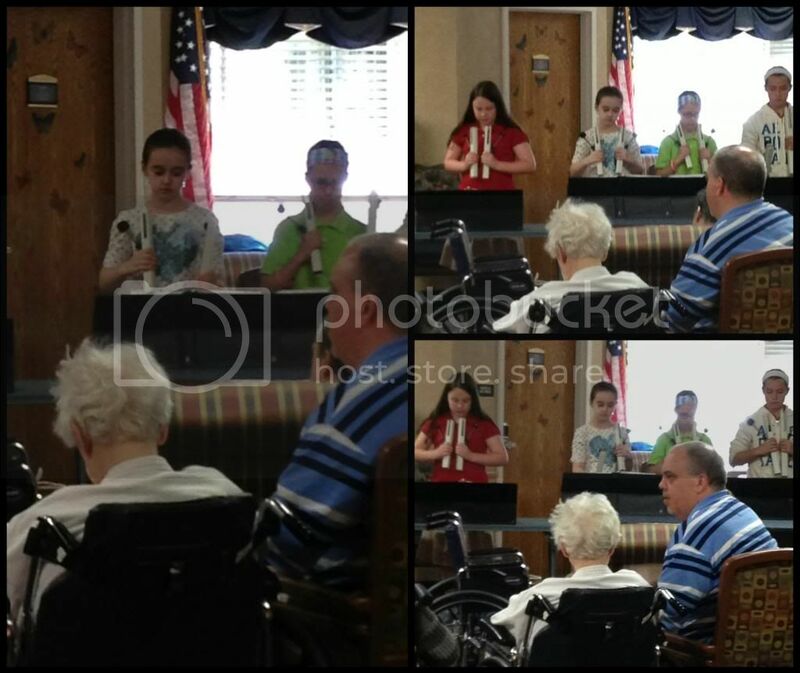 Chimes choir performed at a nursing home on Monday. Amber has felt even worse this week than last week with more "sick" days than other weeks. We were supposed to wait for the 21st of May before we called the GI doctor back with an update, however Amber was doing so poorly on the 14th that I called early. Thankfully, the doctor was pleased that we did call early because the medication should have been working already. Amber is now scheduled for a repeat upper endoscopy on May 24th to check the progress of her damage. Unfortunately for my little girl, she also gets to have a colonoscopy on the same day. Amber has watched me go through colonoscopy prep, she knows exactly how unpleasant it will be. There is no sugar coating this for her. When Amber was able to sit up without feeling dizzy or nauseated we had school lessons at home, mostly on the couch, and also on the floor of our empty house in the subdivision across the street. Our former home is for sale, after several years of renting, and this week we received an offer on it that eventually turned into a contract! Amber and I have spent a couple of days at the "old house" fixing little things that our last tenants left screwy. We actually were at Lowe's (for the zillionth time) when the realtor called with the offer. Most of the work is finished, just a couple more items on our to do list. Then we will see how inspection goes. Prayers that this process goes smoothly and the sale completes would be greatly appreciated. My Mother's Day gift! Planned, designed, and created by Amber. Daddy took her shopping and Grandma oversaw assembly. 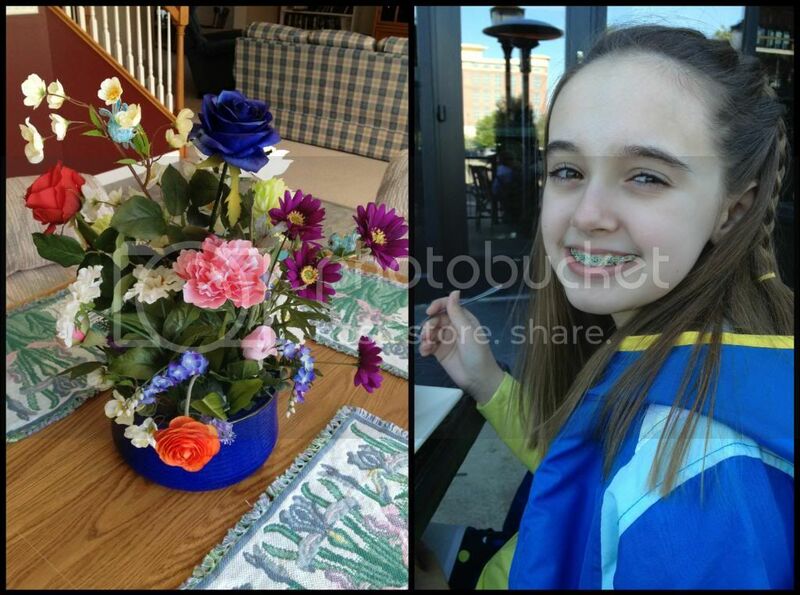 My favorite color is blue, so the blue flower is the centerpiece. And... dinner on the patio at Cheesecake Factory. It was a last minute decision, but we were near by, hungry, and they had a 5 minute wait. Amber really was a trooper though, patiently hanging out at the old house working on assignments, trying to help, and napping for the better part of two days. At one point while she was dusting baseboards, Amber looked out an upstairs window then came running to me all in a tither. "Mom, I can see our house from here... I mean our house we live in." It is so confusing to own two houses 0.3 miles apart. I'm also baffled that the child doesn't remember watching the construction crews build our current house. We had such fun using binoculars, spying out Amber's bedroom window to see how the "new house" was doing. This week, when we were home, Amber has practiced piano as much as her tummy allowed. While she is usually diligent in her piano practice, it is not always enthusiastic. I'm not sure if it is the looming piano performance at recital, or just the current "fun song", but for whatever reason Amber has been turning down opportunities to play with her toys in favor of practicing piano. I think it is her new obsession with Phantom of the Opera. Today, after two hours, (I am not exaggerating) of constantly humming "Angel of Music", I finally had to ask that she find something else. She moved on to "Phantom of the Opera". At which point, I decided to mow the yard. 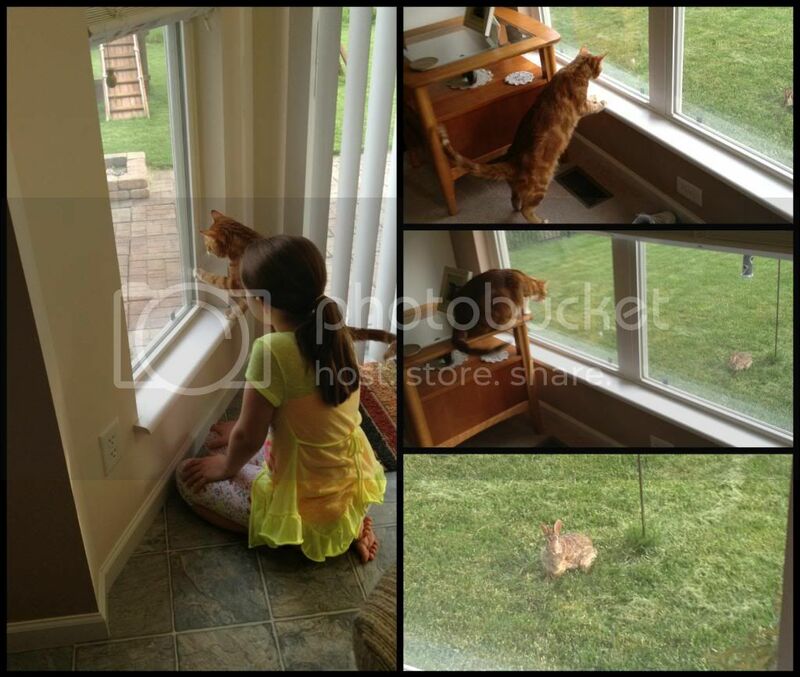 There has also been a lot of bird & wildlife watching by Amber and Biscotti (the kitty). Our beloved bird feeder, gifted to me by my mom when we moved in here, was broken last year by the lawn mowers (first and only time I hired people to mow my yard. It was disastrous). We finally have a new, cheap one that I bought as an after thought at the pet store. Amber has been trying all week to identify the birds landing at the feeder. Biscotti has been trying to attack the birds through the glass. So far we have seen cardinals, robins, finches, sparrows, crows, and hummingbirds (because the lady next door has a feeder and they occasionally get confused). However, the best was the rabbit attracted by my roses that detoured to eat the fallen bird seed. Biscotti spent over half an hour watching this brash critter while running from window to window, pawing, and generally carrying on. Amber sat perfectly still, trying not to scare the bunny as the cat ran around crazy. It was pure entertainment. Does this count as nature study, or entertainment? Ordering for next year's school curriculum has already begun too. I finalized most of our curriculum decisions last month and have been waiting for some sales on the items we needed. This past week I managed to find quite a few good deals on books we will need as well as some curriculum sales. Once all my shipments arrive, we actually will almost be set for 6th grade. This lets me plan at my leisure over the summer, instead of rushing at the last minute. This week I had an ultrasound of several organs looking for the cause of my 4 year long right side pain. Again, it showed nothing... because it's in my intestines. On the positive side, that means there aren't any unknown tumors or growths hanging out. I'm still waiting the results of the blood tests. They took 9 vials of blood! I almost wanted to ask if they needed donations that badly, or was it really necessary to draw that much. But I kept my sarcastic comment to myself, and instead thanked the nice lady with the needle in my arm for not injuring me. Today, Amber and I are hoping for a day of relaxation and some shopping, but it depends on how she feels and if plumber has received the special order part needed for a repair at the old house. Awesome!!! I am so glad you all got an offer on your home. THat is wonderful news. I do hope you can find some relief for your daughter. I'm always impressed with what you do accomplish in your weeks despite Amber and you not feeling well. You are an exceptional mother. Thank you for always linking with Collage Friday! Oh, Amber! What a brave young lady! She always seems to keep on going with that big, beautiful smile of hers! I hope there are answers and treatments very soon. Such a musical girl! (Sam may be able to ride a bike, but he has his MOM'S missing musical genes! LOL) All the best on your house! Could your right side pain by ovarian cysts? (Perhaps that's too personal, but cysts can sometimes cause mild discomfort as I get them.) Have a RELAXED weekend! Cute kitties :) Praying that the home sale goes through smoothly! I'm sorry Amber was feeling so poorly and about all the procedures she must go through. I'll be praying. I really do hope she feels better very soon. Glad you found a buyer for your old house. 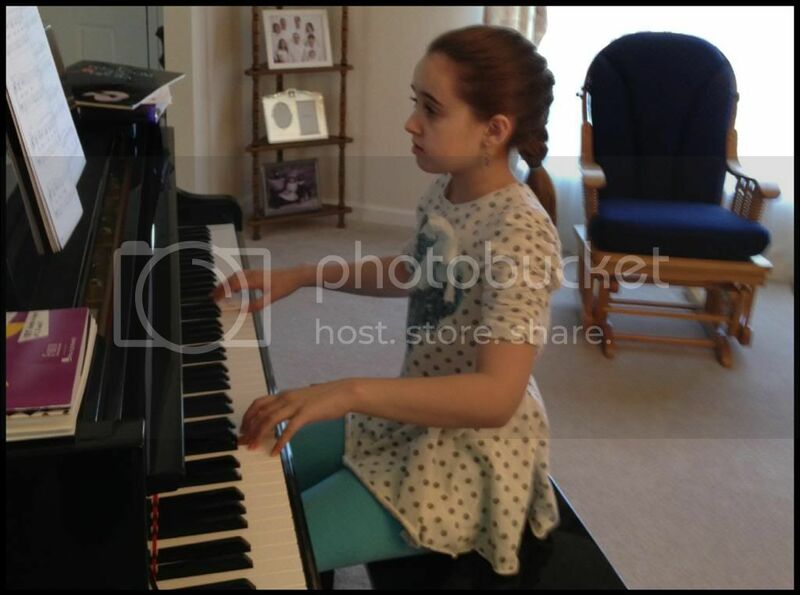 Tell Amber her present is just lovely and that she looks beautiful playing the piano! Thanks for linking up at Friendship Friday!